It’s awards time again at RIBA – the Royal Institute of British Architects – and glass featured prominently in the winning designs. 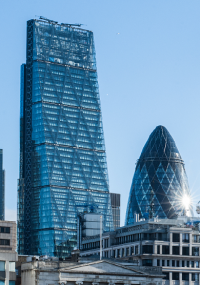 The Leadenhall Building in London, colloquially known as the ‘cheese grater’ won both the RIBA London and RIBA National Awards 2018. The striking building features a tapered, triple-layer glass façade on one side, which encases blinds that adjust automatically to the sun’s movement to keep the office space cool. Such innovation in glass technology would have been beyond comprehension when RIBA began recognising the best architecture over 180 years ago. But advances in glass technology are now so accessible that you don’t have to build a 225m tall skyscraper to benefit from them. Take, for example, liquid crystal glass. Liquid crystal glass (LCD), or smart glass, is the use of glass that allows you to switch between transparency and translucency at the flick of a switch. Liquid crystal glazing comprises laminated glass, with a minimum of two clear or coloured sheets of glass and a liquid crystal film, assembled between at least two plastic interlayers. In the ‘off’ position, the liquid crystals are not aligned, which prevents vision but allows light to pass through the glass. In the ‘on’ position, the liquid crystals align, turning the glass transparent and allowing visibility. The change in transparency takes place within milliseconds. Smart glass technologies include electrochromic, photochromic, thermochromic and gasochromic. The most popular application is electrochromic. Electrochromic smart glass changes light transmission in response to voltage. A burst of electricity is required for changing its opacity between a transparent glass and tinted glass state. Once transformed, it maintains its shade without a continuous supply of electricity. When installed in the envelope of buildings, smart glass creates climate adaptive building shells. These can save costs for heating, air-conditioning and lighting, and eliminate the need for installing and maintaining blinds or curtains. Liquid crystal glazing is designed for internal applications and is favoured in the corporate environment, its most common use being in glass partitions. This glass is also a popular choice for the home – by eliminating the need for shades, curtains or blinds, the liquid crystal in the glass also protects fine furnishings, carpets and displays from UV damage. Smart glass has uses any place where there is a need for privacy or protection. Tufwell Glass stocks a range of smart glass, including electrically-operated LCD specialist glass. Be smart, contact our team today on 01293 533 533 or email sales@tufwell.co.uk to discuss your smart glass needs.